Some bikers are misusing (or simply "missing") the bike lanes. I have seen bikers riding in the right-side parking/turning lane to the right of the bike lane. This is confusing to drivers, who should be trained to look for bikers between the lines of the bike lane. I feel safer. Whatever mode of transportation one is using, a safe street is all about consistent expectations - it's why we have traffic laws, road signs, and striping. The bike lane adds a layer of expectation and allows a bike rider to assert him or herself as a legitimate user of the road. 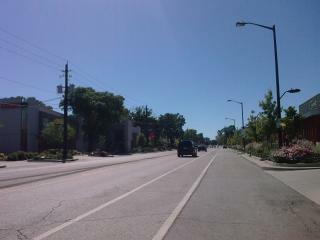 I am an assertive, but not aggressive biker and find a good balance on Ingersoll now. There are a variety of users During my use of Ingersoll so far, I have seen a broad spectrum of bike riders from elderly women to families to commuters. Some people have had baskets, and have obviously done some shopping on Ingersoll businesses. The new lane arrangement will enhance the redevelopment of Ingersoll as a pedestrian business district. During this redevelopment there may be some pain - for drivers, bikers, residents, and businesses - as we all figure out how to "navigate" the change. Ultimately, this is the direction that we need to be moving as a City and as a society.